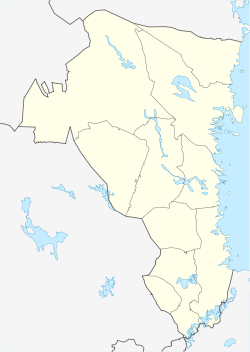 A Hälsingland farm or Hälsingegård is a farm or former farm in Hälsingland, Sweden, with preserved cultural and historical value. The farmhouses of Hälsingland are a cultural heritage and an example of traditional Swedish construction technique in the old farmer’s society in Hälsingland. The magnificent dwelling houses of the farms have become symbols of the term Hälsingland farms, although the farm as a production unit, including out buildings and land, is what constitutes a Hälsingland farm. The Hälsingland farms reflect the rural construction techniques, using only wood, and are an expression of the popular architecture; the farmer’s way of building as it evolved when means flourished. To depict a general idea of the Hälsingland farm is difficult as they vary between parishes and periods of time. The uniqueness of these farms lie in the farmer’s ambition to build big. Nowhere in the world is such a collection of large farms as in Hälsingland. The farms have large and elaborately decorated dwelling houses, often two or three, sometimes housing several generations, whereas some houses were used only for festivities and others for sleeping, so called ”bed-cottages”. Most often they were two stories, but there are also examples of one story cottages with room for two families. The well-constructed dwelling houses, often lavishly designed with profiled roof-bases, elegantly profiled joinery work around windows and beautifully decorated doorways, mainly represent the construction style of the 19th century, but there are also older farms with low, unpainted houses built in a square shape around the yard, as well as start-of-the-20th-century buildings with rich ”carpenters joy” and large porches. For periods of time, each parish had their own style of constructing, mainly shown in the lavish front porches and otherwise elaborate entrances. Some areas, foremost the coastal parishes, lacked front porches entirely; instead they had more costly doors and door fittings. Inside the farms houses of Hälsingland are magnificent and well-preserved interiors with art painted on the walls, stencilled wall decorations, and expensive wallpaper. Biblical motifs were transformed into Hälsingland milieu, funny stories and cautionary tales mixed in the artwork with the decorative style of the wandering painters from Dalarna, characterized by religious motifs, ribbons and large flowers. Expensive, imported wallpaper was combined with popular painting into something entirely new, and the stencilled paintings in many places flowed onto walls, ceilings and fireplaces. The amount of well-preserved interiors kept in its original site, is unique in the world. With the farms in Hälsingland also came a large number of out buildings, freely placed outside the courtyard. Grand barns, large log cabins, smithies, breweries, grain storage houses, stables and liveries all give a picture of the system of many outhouses, which by the end of the 19th century was replaced by large multifunctional buildings that housed many functions under the same roof. Often the farms of Hälsingland are connected to other buildings such as mills, water works, and summer farms, providing us with a glimpse into the culture of Hälsingland. The farms are placed in village structures of the olden days, with roots in prehistoric times, only partly changed from the original 19th century sites. Still today, there are around one thousand farmhouses of Hälsingland preserved in the province, all with their own story to tell. Some of them have been nominated to UNESCO list of World Heritage. 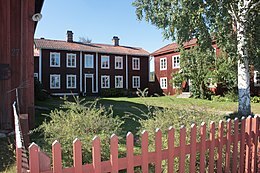 ^ "Decorated Farmhouses of Hälsingland – UNESCO World Heritage Centre". Retrieved 10 January 2013. Wikimedia Commons has media related to Decorated Farmhouses of Hälsingland.